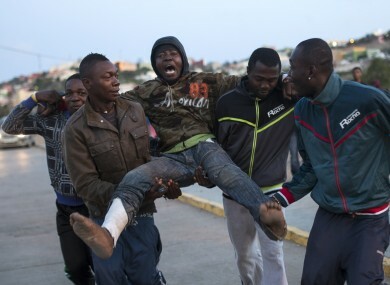 At least 1,000 sub-Saharan Africans had joined in the pre-dawn attempt to enter Melilla, one of two Spanish-held cities on the northern coast of Africa. ABOUT 500 AFRICAN migrants leapt a towering, triple-layer border fence to cross from Morocco to the tiny Spanish territory of Melilla, one of the biggest breaches in nearly a decade, officials said. At least 1,000 sub-Saharan Africans had joined in the pre-dawn attempt to enter Melilla, one of two Spanish-held cities on the northern coast of Africa affording the only land crossings to Europe, they said. Night-time video images released by the Spanish Guardia Civil police showed scores of young men leaping over the inner layer of seven-metre (23-foot) high border fencing, which had partly collapsed, and then running into Melilla. “We calculate that about 500 managed to enter by irregular means into our territory,” said Spain’s state secretary for security, Francisco Martinez, who made an emergency visit to Melilla following the intrusion. “Once again, we see that the assaults were violent on the Moroccan side,” he said. Martinez called on the European Union to play a “much more active role” in securing the bloc’s southern borders. Criminal organisations appeared to have planned the border breach, he said, targeting weak areas of the fencing that had yet to be strengthened. An extra 100 Spanish police reinforcements would arrive later in the day to help secure the border while the installation of anti-climb fencing would be accelerated, he said. In a further sign of the pressure on Spanish borders, the Moroccan authorities said on the same day that a boat carrying 11 people, mostly from Cameroon, had capsized off the Moroccan coast while heading for Spain. The bodies of two drowned people had been recovered, one other person was still missing and the rest of those aboard had been saved, officials said, according to Moroccan news agency MAP. In Melilla, a Spanish government spokesman said some of those who got into the city had been treated for “very light injuries” in a clinic at the city’s immigration reception centre. On the Moroccan side, the authorities in nearby Nador said about 1,500 people in five groups had joined the assault on the border fence. “They did not heed the usual warnings and they proceeded to throw stones, injuring four members of the security forces,” an official told AFP. Ten of the migrants were injured and treated in hospital in Morocco, Nador authorities said. Spanish police struggled to halt the influx despite deploying in large numbers and benefiting from the cooperation of Moroccan security forces, Melilla president Juan Jose Imbroda told Spanish public radio RNE. “They came in waves,” he said. Melilla, which lies on the northern coast of Morocco, is enclosed by an 11-kilometre (seven-mile) border fence running in a semi-circle up to the Mediterranean. Nevertheless, migrants gathering in large numbers on the Moroccan side have repeatedly managed to cross over. “Despite a large deployment of Moroccan security forces, they are trying to overcome them to get in,” Spanish Interior Minister Jorge Fernandez Diaz told reporters in parliament in Madrid. Overcrowding in the Melilla immigration centre was reaching a critical point, he said. The centre in Melilla is built to house 480 immigrants but it was holding about 2,000 even before the latest wave of entrants, officials said. The number of Africans trying to cross into the two Spanish territories has surged over recent months. Email “500 African migrants leapt a fence into Spanish territory today”. Feedback on “500 African migrants leapt a fence into Spanish territory today”.